Gold ETF's and much more. 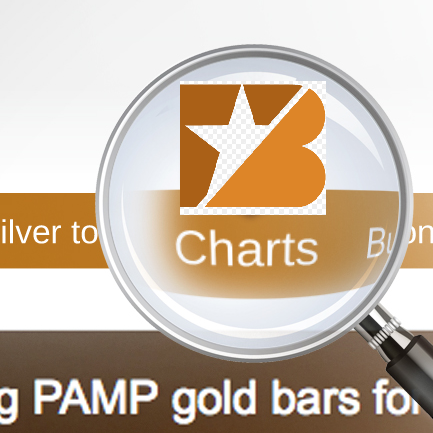 BullionStar’s ‘Gold Market Charts’ is a series of articles covering topical developments in the world’s major physical gold markets. 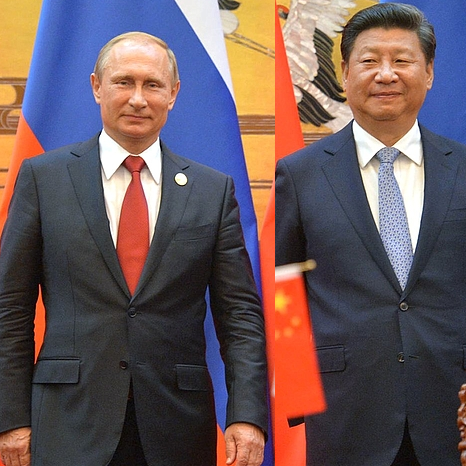 These topics include sovereign gold reserve accumulation by Russia and China, gold demand in the wider Chinese gold market, Swiss gold imports and exports, and gold flows into and out of the London Gold Market. The analysis uses gold charts made available by the GOLD CHARTS R US market charting website. 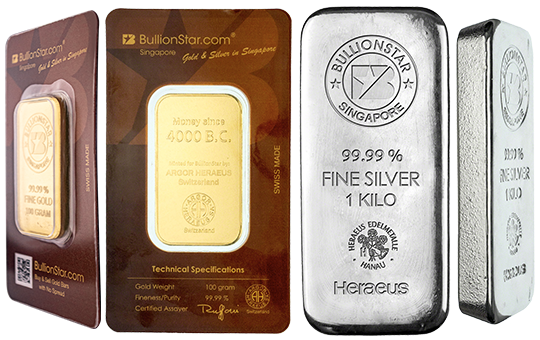 For BullionStar’s own extensive price charts, see BullionStar’s website under the Charts menu, where, for example, currencies, cryptocurrencies, stock market indices and commodities can be charted and measured in terms of gold, silver, and other precious metals. 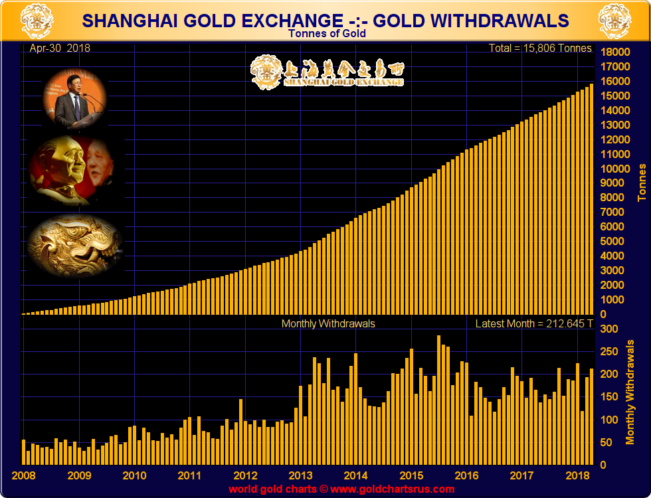 It is now a more or less accepted fact in the global gold market that physical gold withdrawals from the Shanghai Gold Exchange (SGE) are a suitable proxy for overall wholesale Chinese gold demand. In other words, SGE gold withdrawals are a suitable proxy for gold demand in the domestic Chinese market. Why this is so is related to the structure of the Chinese Gold Market, where mined gold, imported gold, and scrap gold either is obliged to be sold through the SGE, or is incentivised to be sold through the SGE. See “Mechanics of the Chinese Domestic Gold Market” for more details. 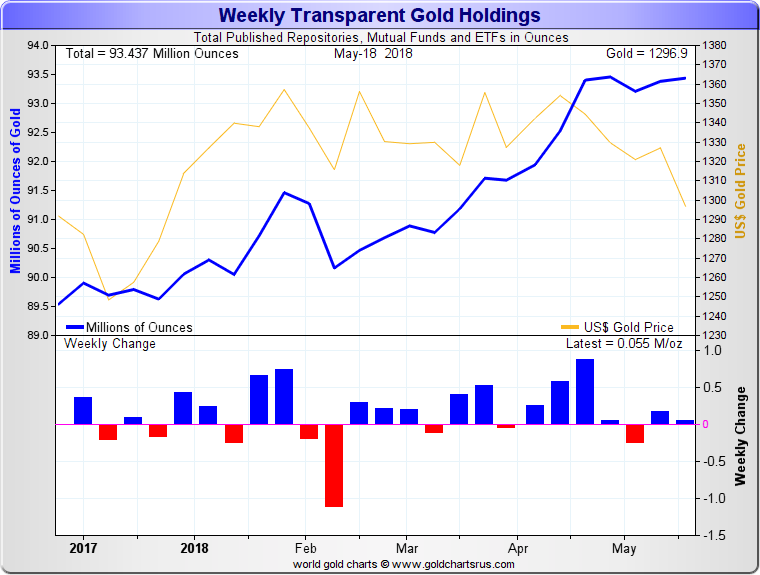 Given this relationship, gold withdrawal figures from the SGE are a closely watched statistic in the global physical gold market. At the close of 2017, gold withdrawals from the SGE totalled 2030 tonnes for the year. This was slightly higher than the similar figure for 2016 of 1970 tonnes, but below the record annual total for the year 2015, which clocked in at 2596 tonnes. The 2017 figure was also slightly below corresponding figures for 2014 and 2013, which reached 2102 tonnes and 2197 tonnes, respectively. Which is why 2018’s year-to-date SGE gold withdrawal figures are worth analysing. 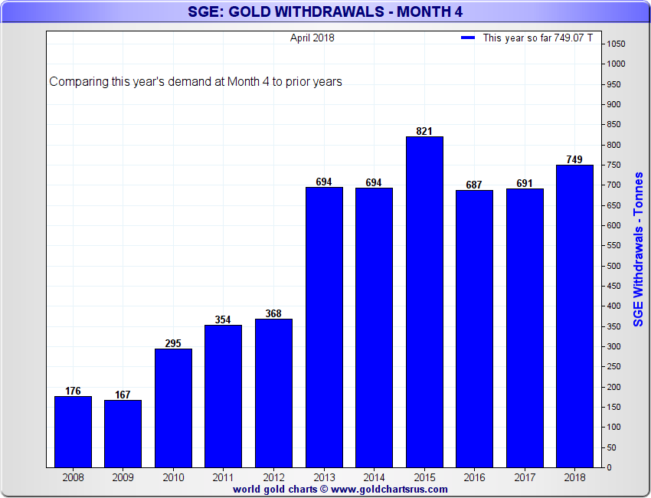 Looking at the combined gold withdrawal figures from the SGE for the first four months of 2018 (January to April inclusive), the year-to-date total for the end of Month 4 is running at 749 tonnes. This means that so far this year, the Chinese domestic gold market has demanded approximately 749 tonnes of gold from the nationwide gold vaults of the SGE. This gold has physically left the SGE vaults and entered the Chinese gold market. This figure of 749 tonnes is also the 2nd highest Month 4 total on record, with only the corresponding end of April figure in 2015 coming in higher. On an annualised basis, if the withdrawal volumes from the SGE continue at the same pace as the first four months, 2018 would see SGE gold withdrawals of 2996 tonnes, which would be a new record, and would nearly equate to annual world gold mining production levels. While the SGE gold withdrawal rate for the rest 2018 will probably decelerate, the monthly SGE gold withdrawal figures for the rest of the year are still worth watching closely. 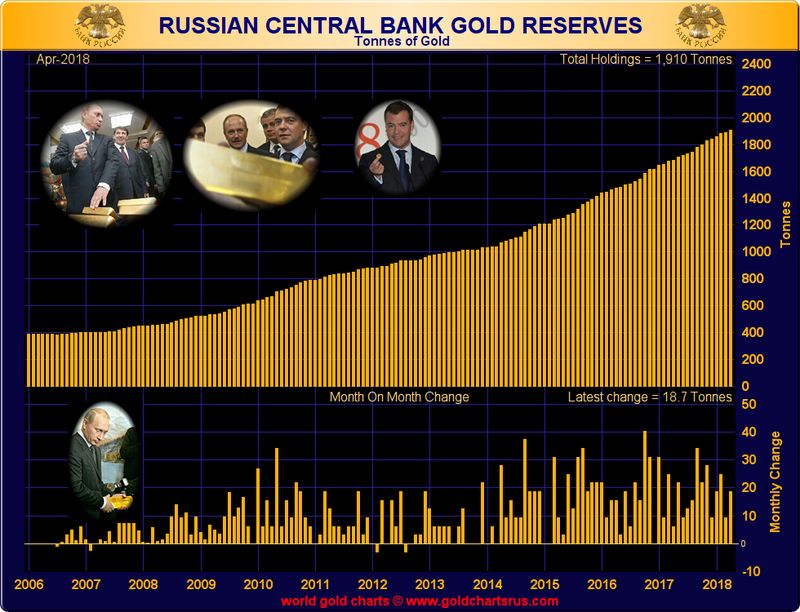 Following a notable year in 2017 during which the Russian Federation, through its central bank, added 223 tonnes of gold to its strategic gold reserves, 2018 looks set to be equally active for Russian physical gold accumulation. 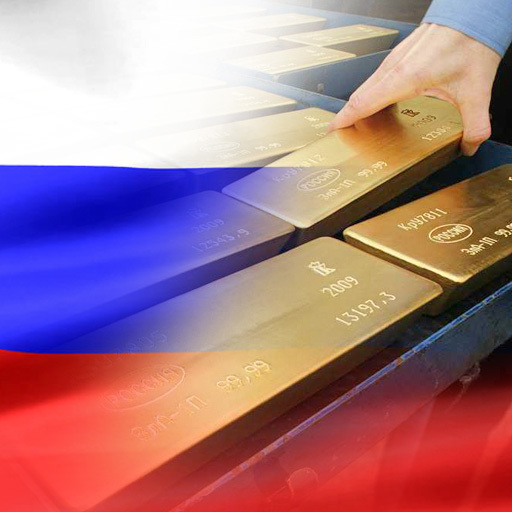 According to official data, between January and April 2018 inclusive, the Russian central bank (Bank of Russia) added 2.3 million ounces of gold (71.5 tonnes) to its strategic gold reserves. Annualised this would be 214 tonnes. 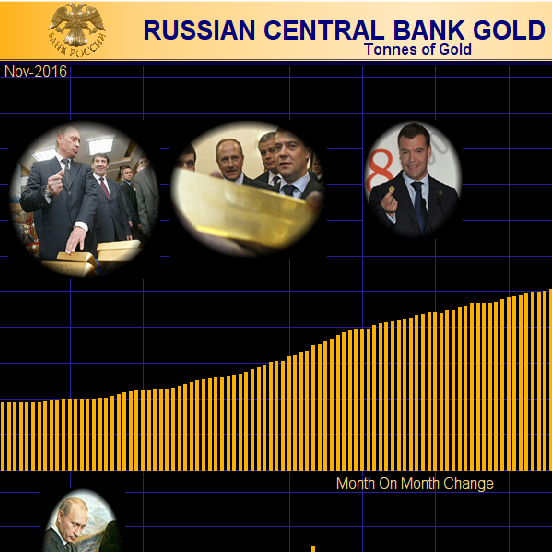 While Russia’s monthly gold additions are not totally smooth, they do follow a pattern, with rounded amounts of troy ounces being added each month, sometimes at the same velocity. 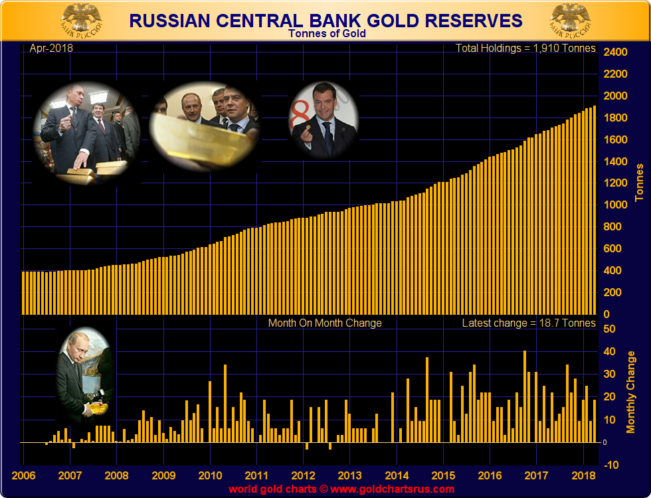 Specifically, Russia added 600,000 ozs of gold to it reserves in January, 800,000 ozs in February, 300,000 ozs in March, and 600,000 ozs again in April. 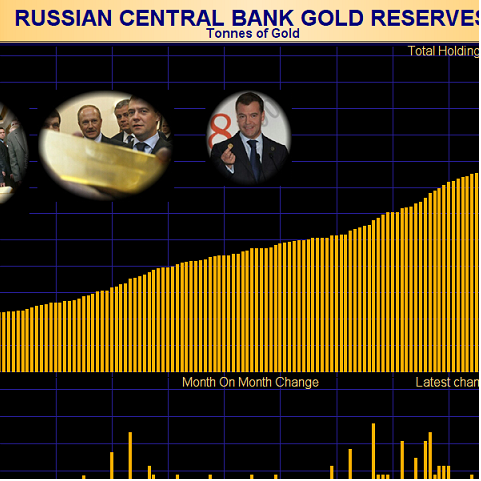 These latest gold reserve additions bring Russian gold reserves to 1910 tonnes, comfortably above the claimed gold reserves of China’s central bank, the People’s Bank of China. Since October 2016, China has continued to announce unchanged gold reserves each month and its official gold reserves remain static at 1842 tonnes. More than likely however, China is still actively accumulating gold, but is not publicising it. This lack of reporting not unusual for China, and there have been long periods in recent history during which the Chinese have remained tight-lipped about gold reserve accumulation, only to announce significant purchases after the accumulations have taken place, for example in April 2009 and June 2015. The Gold Price denominated in US Dollars remained in a very tight $50 trading range for the year-to-date with four to five moves up to the $1350 level and corresponding retracements back towards the $1300 level. 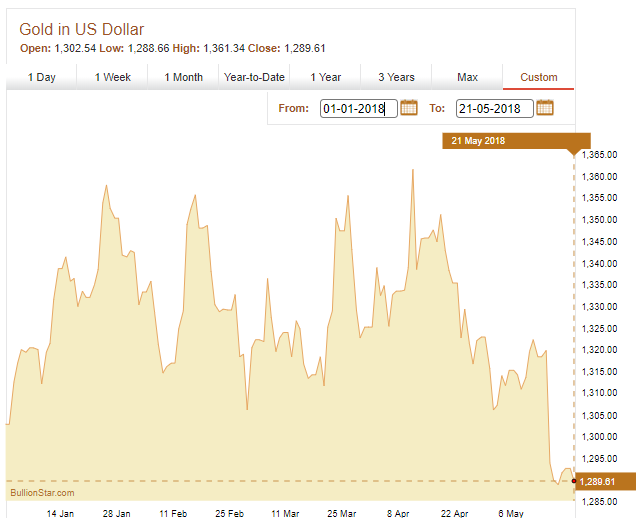 More recently during May, the USD gold price has broken down below the $1300 level to the $1290 mark. Against this backdrop and time period, the series of gold-backed ETFs, gold-backed platforms, and other transparent gold holdings (e.g futures exchanges inventories) tracked in the following chart saw a combined increase in their gold holdings of approximately 4.5 million ounces, rising from 90 million ounces (2800 tonnes) to 94.5 million ounces (2940 tonnes). 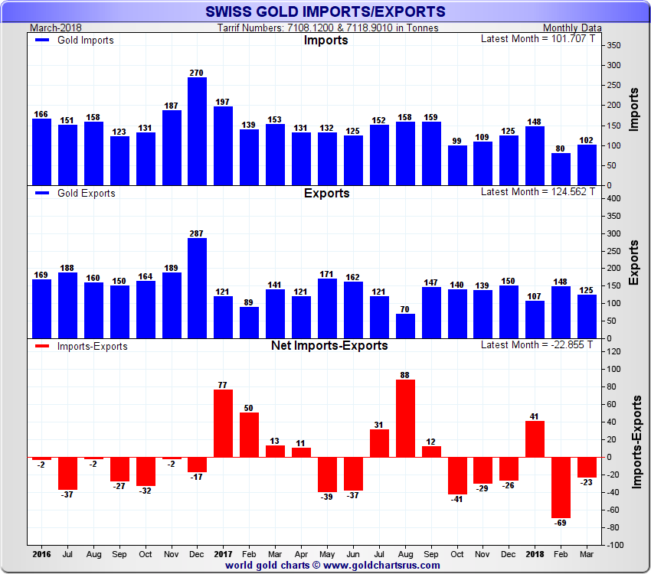 Since Switzerland hosts the largest gold refining sector in the world and its refineries produce the lions share of new gold bar production, Swiss trade statistics on non-monetary gold imports and exports present a good opportunity to see physical gold flows coming in from the rest of the world, and going out to the rest of the world. The big Swiss gold refineries in this sector include PAMP, Valcambi, Argor-Heraeus and Metalor. 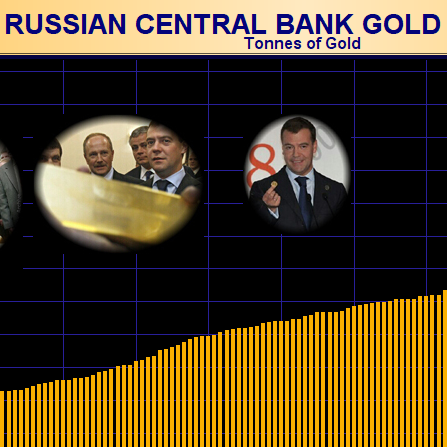 Note that non-monetary gold refers to all gold that is not classified as central bank gold. 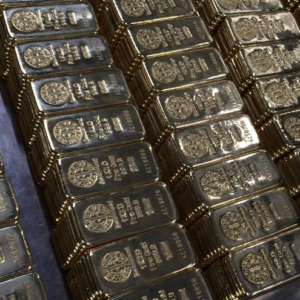 Central banks get an exemption from reporting monetary gold movements across borders, so unfortunately, central bank gold movements are not reported by Swiss Customs data or any other similar data around the world. 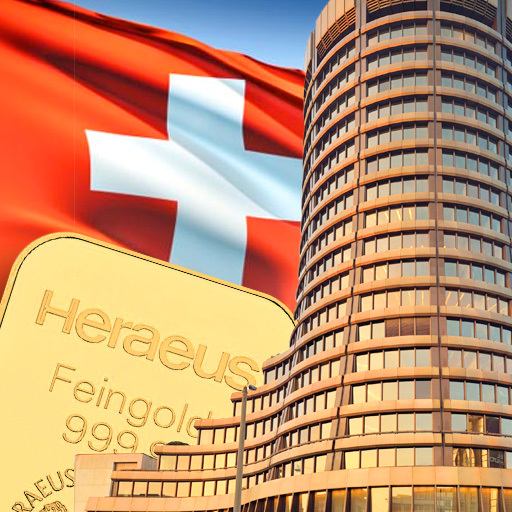 Nonetheless, the non-monetary gold statistics published by Swiss Customs are useful for inferring activity in the Swiss gold refining sector and in the wider Swiss gold market. 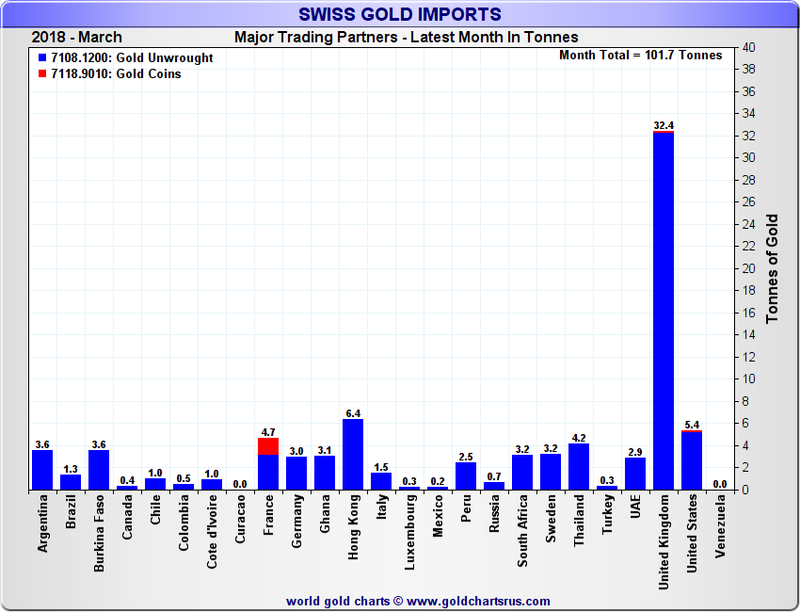 During March 2018, physical gold imports into Switzerland totalled 102 tonnes, which although higher than February’s 80 tonnes of gold imports, is still somewhat lower than recent monthly averages. Overall, the first quarter of 2018 has been quite subdued for gold imports into Switzerland, with only 330 tonnes imported year-to-date. 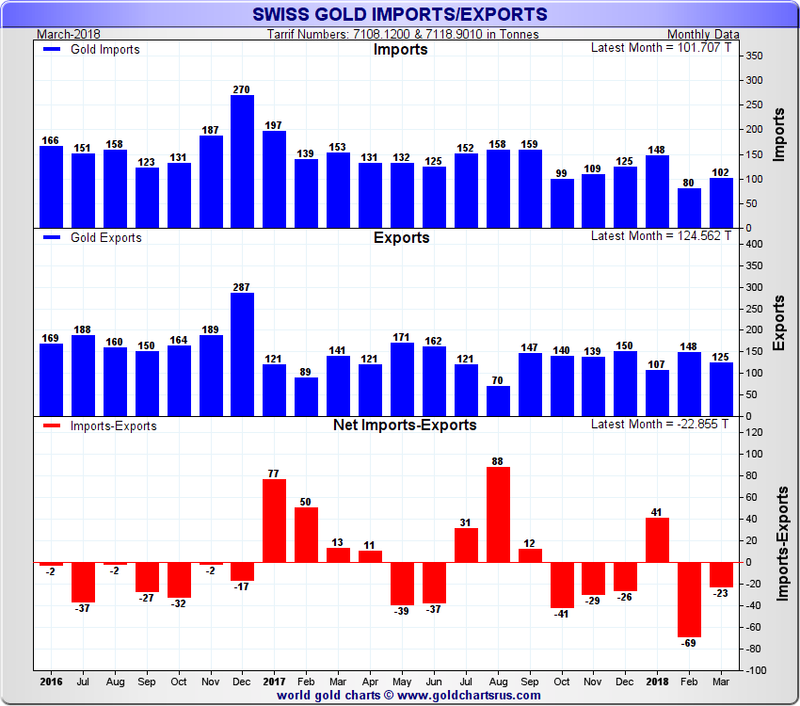 On the export side, gold exports out of Switzerland during March 2018 totalled 125 tonnes. 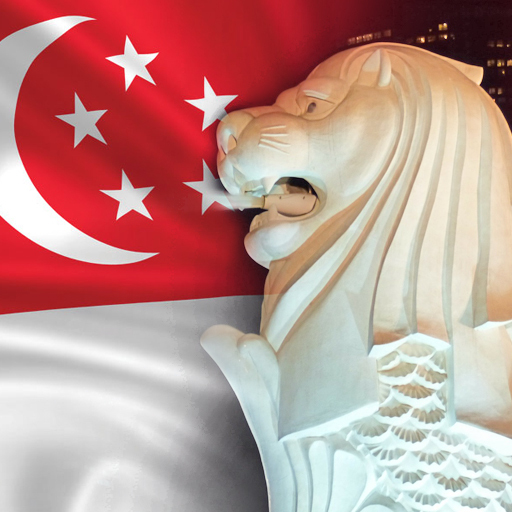 While this was also a relatively low figure compared to the recent past, gold exports for the first quarter totalled 380 tonnes, signalling slightly higher activity on the outbound routes from Switzerland between January and March. 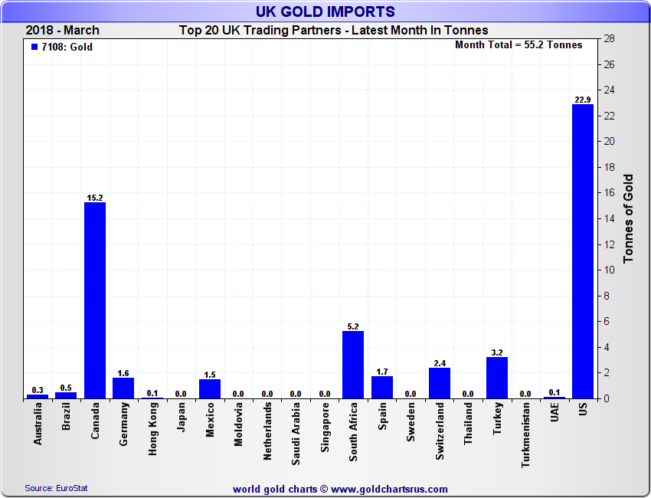 On an individual country basis sending and receiving gold to and from Switzerland, apart from a few tonnes of gold supplied from Hong Kong, the UK market (i.e. 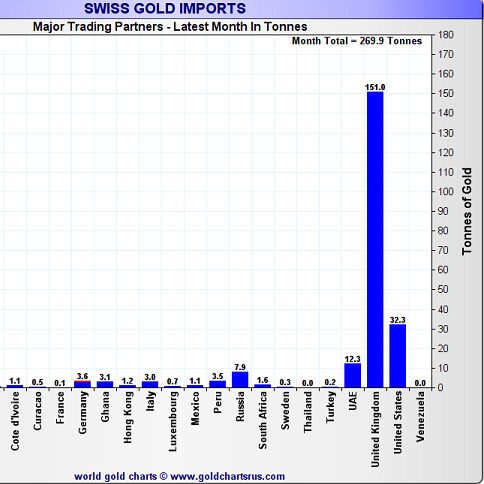 London) was the only notable supplier of sizeable amounts of non-monetary gold into Switzerland during March. 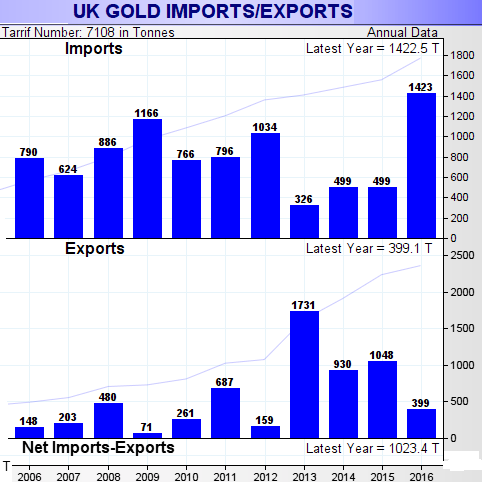 Note that since the UK does not have any gold mines, any discussion of the UK exporting gold really refers to the London Gold Market exporting gold from the vaulted gold stocks held there. Swiss gold imports from the UK (London) can also be seen from the flip-side by looking at London gold exports during March. The following chart shows that during March, the UK (London) supplied 65.4 tonnes to the Rest of the World, with 32.1 tonnes going to the Swiss, followed by 16.1 tonnes to China, 10.5 tonnes to Turkey and 6 tonnes to the UAE (Dubai). Again, China makes an appearance with direct exports of gold from both the UK and Switzerland to China during March. The source countries supplying gold to the UK (London) market are likewise interesting and neatly illustrate the intermediary role of the London Gold Market in taking in gold from some markets while supplying gold to Switzerland and other markets. 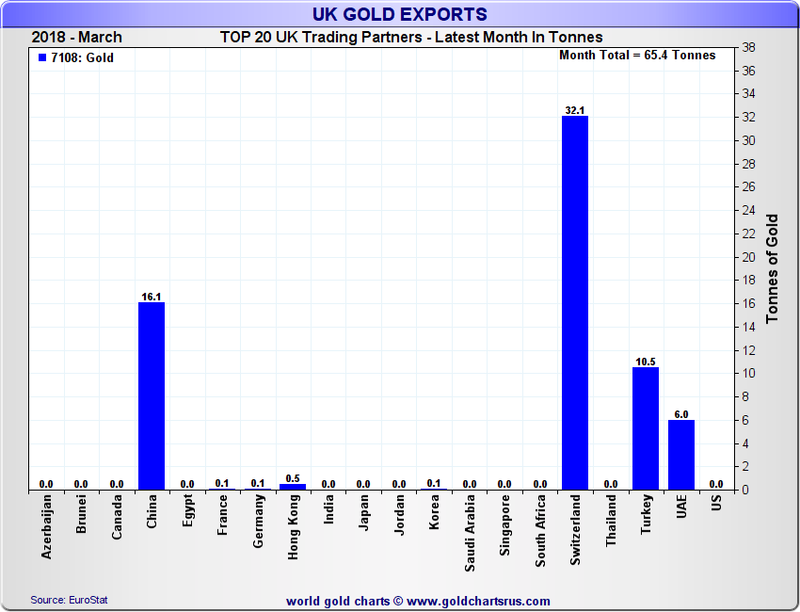 During March 2018, the London Gold Market imported 55.2 tonnes of gold, or which 78% came from three significant gold producing nations, namely 22.9 tonnes from the USA, 15.2 tonnes from Canada, and 5.2 tonnes from South Africa. 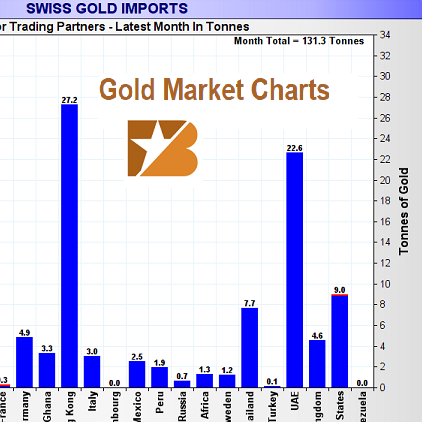 Turing back to Switzerland, surprisingly the other regular suppliers of gold to the Swiss such as the US and UAE (Dubai), which had been active in recent months, were absent or only marginally active during March. 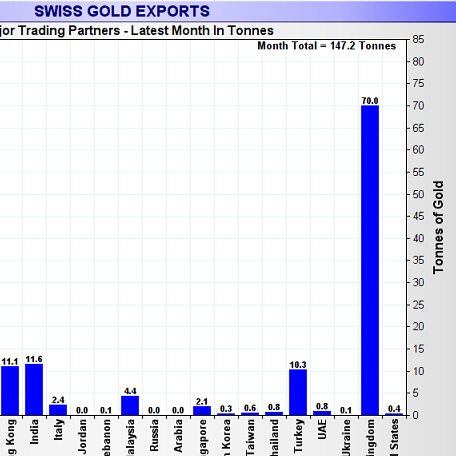 For example in January, the US, UAE and Thailand were all significant suppliers of gold to Switzerland. See following chart for details. 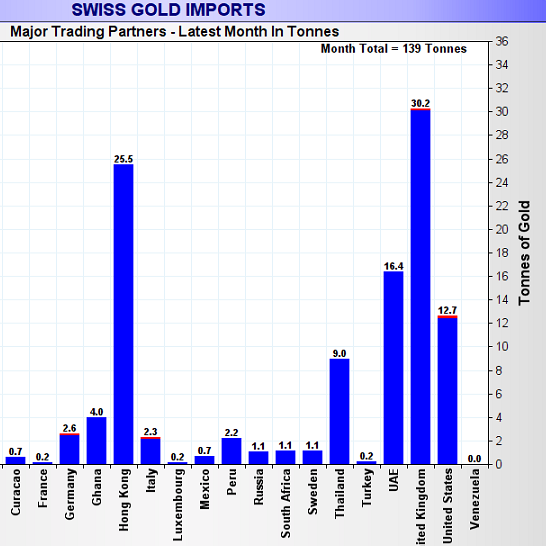 As regards destinations of Swiss gold, during March the Swiss refineries sent the bulk of their gold output to Hong Kong, China and to a lesser extent India. 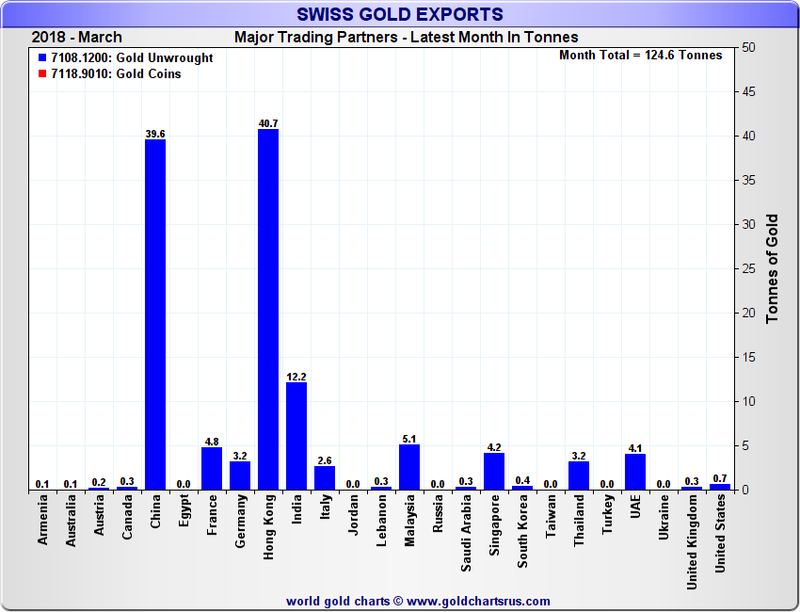 of the 124.6 tonnes of non-monetary gold exported from Switzerland during March, 92.5 tonnes (or 84%) went to Hong Kong, mainland China and India. 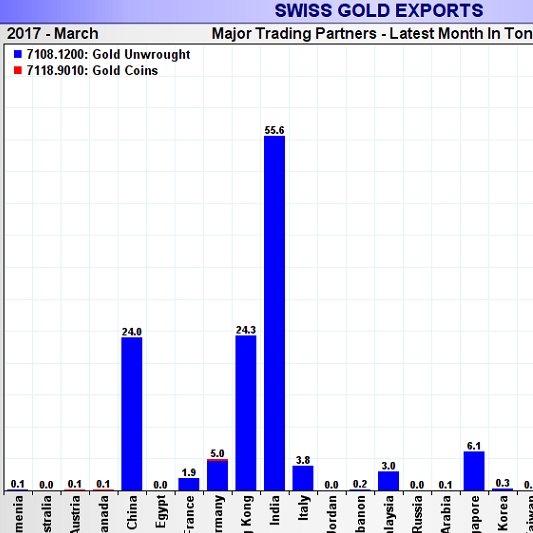 Malaysia and Singapore also imported significant quantities of gold from Switzerland during March, taking in nearly 10 tonnes between them.